Some manuscripts have only 2 categories of people: (1) those whose faith is wavering and therefore need to be snatched from the flames of judgement, and (2) those who need to be shown mercy. Greek, with fear, hating even the clothing stained by the flesh. Not specified by Bible text. The flames provide the light source in this scene. 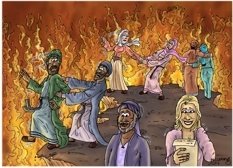 None specifically named – we can see a Christian man and woman grabbing hold of two others and trying to prevent them from walking into the flames. 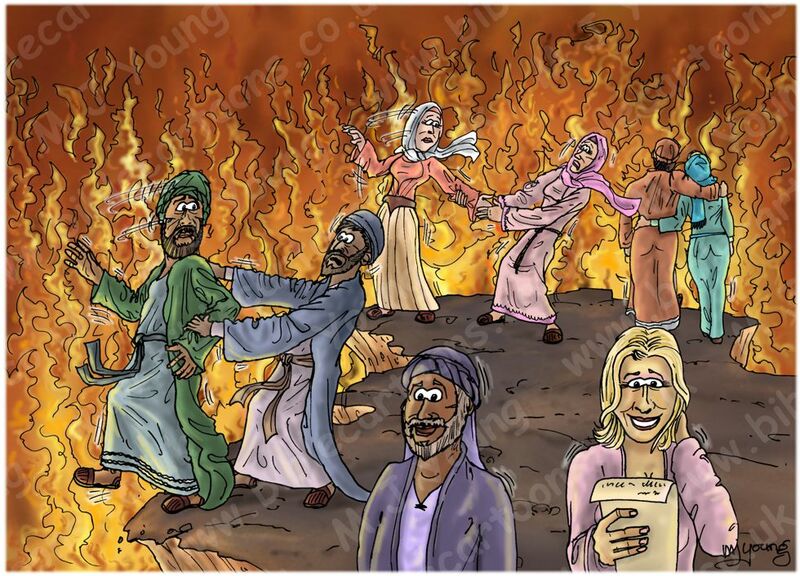 This scene is inspired from the phrase “Rescue others by snatching them from the flames of judgment” in verse 23. In my picture you can see several people walking towards the edge of a rocky cliff. 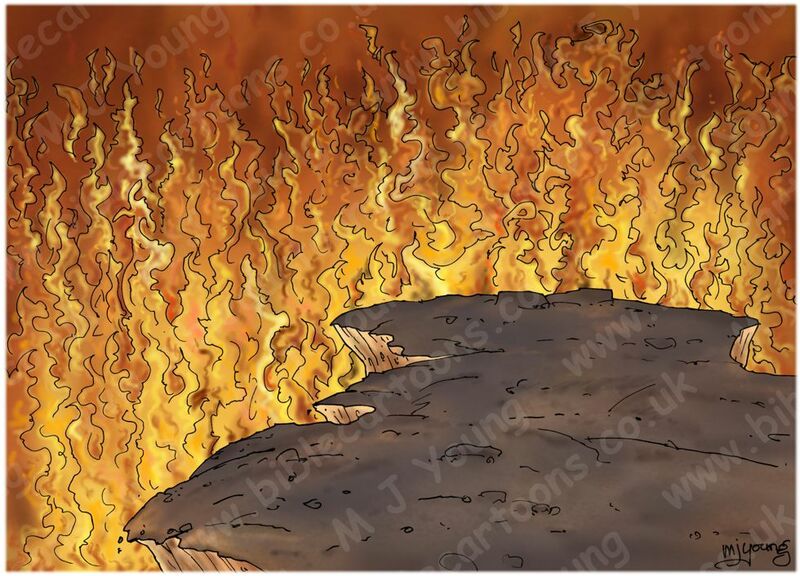 Unless they are helped, and shown the danger of the fire, they will simply walk off the cliff into the flames. Notice the untroubled expressions on the people’s faces, as they head towards their doom. The couple in the top right, arms around each other as they stroll, is shocking when you consider where they are heading. The lady in the bottom right is reading a piece of paper, blissfully unaware of the danger she faces. There are many distractions to overcome in this life; the letter the woman is reading represents those distractions. As Christians we know that the flames of judgement are very real. It is up to us to warn disbelieving people about the danger they face at the end of their physical life on earth. The cliff edge represents the end of a person’s life. The two people (a man in grey/blue and a woman in pink) can be seen grabbing two people and trying to save them from walking over the cliff edge. Many people alive today are unaware of the danger they face. But there is good news, anyone can escape the flames of judgement, simply by accepting Jesus the Christ as their Lord and Saviour. By this simple, yet life-altering act, we can pass from the kingdom of darkness into the kingdom of light: from eternal separation from God (we call that Hell) into eternal life with Him, where He dwells, which we call Heaven. And that is the only way that we can avoid falling into the eternal flames of hell. Background landscape, without the figures. 1. Judas, a half brother of Christ, a son of Joseph and Mary after Jesus was born. The term “servant” (in verse 1) would be fitting in light of the fact that at first Jesus’ brothers did not believe in Him (see John 7:5.) But later they saw the resurrected Christ and were convinced (see Acts 1:14). Among these people was this Judas, who did not consider himself worthy to call himself a “brother” but just a “servant” of Jesus the Christ, possibly because of that earlier doubt. 3. Judas Barsabbas, a leader in the early church of Jerusalem. Sent to Antioch with Paul, Barnabas & Silas (Acts 15:22), he could have been a brother of Joseph Barsabbas, who was one of two “nominees” to replace Judas Iscariot (see Acts 1:23). It is most probable that the Jude who wrote this letter was the half brother of Jesus the Christ.